What's more fun than dressing up in costume? Dressing up your dog in costume! These DIY doggie costume ideas are perfect for Halloween (or really any time of year you want to adorn your pup in something silly) so you can take your furry best friend along trick-or-treating! Is your dog going to be joining you while you go out trick or treating this year? If so make sure your pet has a costume to wear too! 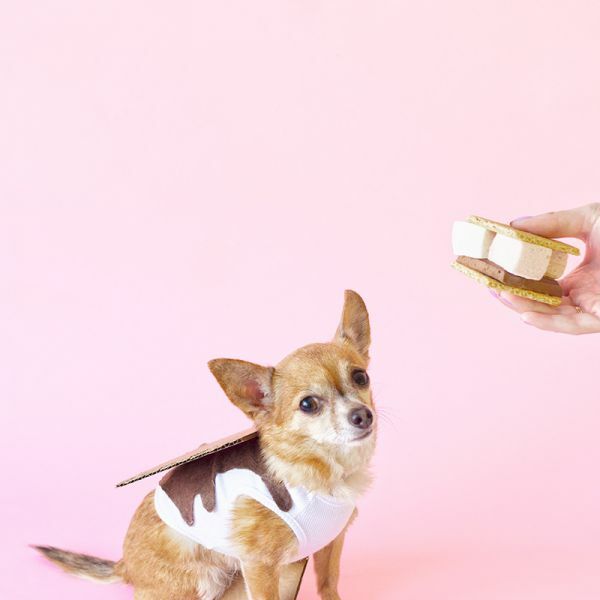 By adding some brown felt, and cardboard to an old white dog shirt you have around the house you can quickly you dog a s'mores costume to wear this Halloween. Dogs always look so cute wearing Halloween costumes, but this handmade unicorn costume with a rainbow tail is so adorable that everyone who sees your dog in this costume is sure to have a huge smile on their face. Make sure to take lots of photos of your dog dressed up as a unicorn as they will be photos you will treasure and want to share to with family and friends. Superheroes are often a popular costume choice for kids at Halloween, so if your child wants to be their favorite superhero for Halloween this year dress your dog up as a superhero too to match. This way when you bring your child out trick-or-treating for Halloween they will have their own little superhero league. Dress your dog and child in a matching costume with this super cute idea of dressing your kid like Little Red Riding Hood by having them wear a red cape and your dog as "grandma" or The Big Bad Wolf by giving your dog a cotton balls wig which can be topped off with a shower cap. The end result of the matching child and dog costume is spectacular and is sure to bring a smile to the face of everyone who answers the door when you take your child and dog out trick or treating this year. With a bit of felt, wood rings, and paint you can assemble a race car driver costume for your dog that is perfect for smaller dogs. Once the DIY costume is ready, you simply need to sit him in your cardboard box car and begin taking photos of your super cute pup. Celebrate the treat part of trick or treating by dressing your dog up as a big piece of 3 colored cotton candy on a stick with DIY costume that happens to have a matching DIY cotton candy costume for adults too. 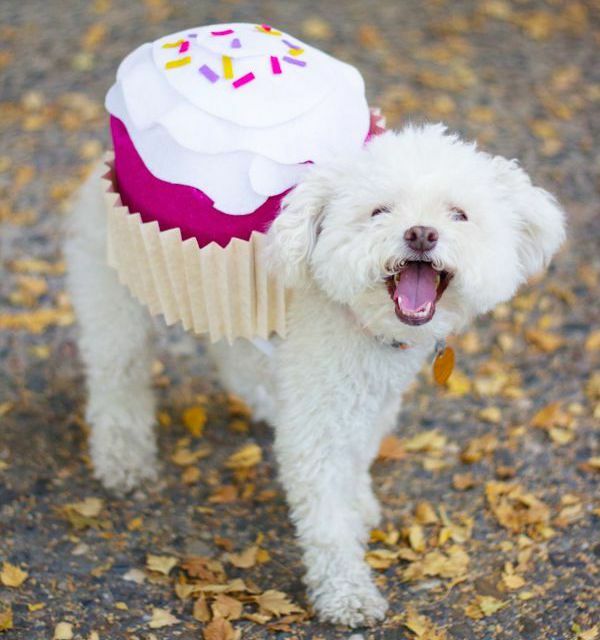 Sure your dog is cute, but without question, your beloved pooch would look even more adorable this Halloween dressed up as a cupcake with sprinkles. You can easily make an inexpensive cupcake costume for your dog, by using a paper mache box which you can decorate with sheets of felt in about 1 hour. Dress up your dog this Halloween as the king of the jungle, a lion with this DIY lion costume that is made by creating a fuzzy mane. This costume looks particularly good on dogs with a tan or light brown coloring so that it matches the mane, but any dog can wear the costume. While some animal costumes are adorable, this costume happens to be cute and comfortable for your dog to wear too. This heart face emoji costume is made by decorating a yellow dog shirt, but it could easily be customized to have your favorite emoji expression instead. If you have yet to figure out what you will wear for Halloween, you can always make a matching costume for yourself by decorating a yellow shirt just like you will for the dog's costume. For Halloween this year dress your dog up a giant loofah by sewing decorative mesh to a dog shirt for an original costume idea for your dog that is sure to make people laugh. Unlike regular piñatas, this one piñata you do not want to break. By using sheets of fringed paper you can dress your dog up using crepe paper you have around the house, making this the perfect last-minute costume idea for your dog. Dress your dog up as a popular breakfast dish, the pancake with this original costume idea. By decorating two small foam circles to look like pancakes you can attach them using an elastic on either side of your dog for a fun costume. From the old school cartoon to the newer movies generations of children and adults have grown to love the Teenage Mutant Ninja Turtles, so for this Halloween try dressing up your medium to a large sized dog as your favorite ninja turtle. No matter which turtle you liked best, making all the costumes is nearly the same, start by decorating a large turkey pan for the shell and use colored ribbon in orange for Michaelangelo, blue for Leonardo, red for Raphael, and purple for Donatello. Inspired by the film Lady And The Tramp with the famous spaghetti scene between the two dogs, you can make a cute spaghetti costume for your dog to wear this Halloween. Weave together some felt to create a basket that you can stick onto one of your dog's shirts and cover the rest of the shirt with cut flowers to dress your dog as a basket of flowers for Halloween this year.